Smokey The Bear had been looking forward to his annual trip to Disney World for months. However, as he soon found out, preventing forest fires was a job that only he could do. Smokey had been avoiding all work correspondence, but on Wednesday, as he was taking a picture with Mickey Mouse, a notification marked *EXTREMELY URGENT!!!!! * appeared on his phone. The well-meaning photographer suggested he might need to check the email, and his entire trip was destroyed. 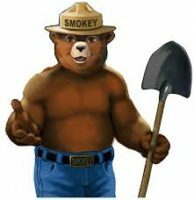 In a later interview, Smokey expressed his hope that the entire world burns in a forest fire so that he never has to return to his job again.